Dartmoor is one of my favourite places down here in the sunny South West of England. I love its wildness, its romance and its legends. I love the Dartmoor ponies who've been up here since forever and just carry on with what they're doing regardless of whether you're around or not. I love the rocky tors sitting in the midst of the rolling uplands, surrounded by bracken and wild heather. 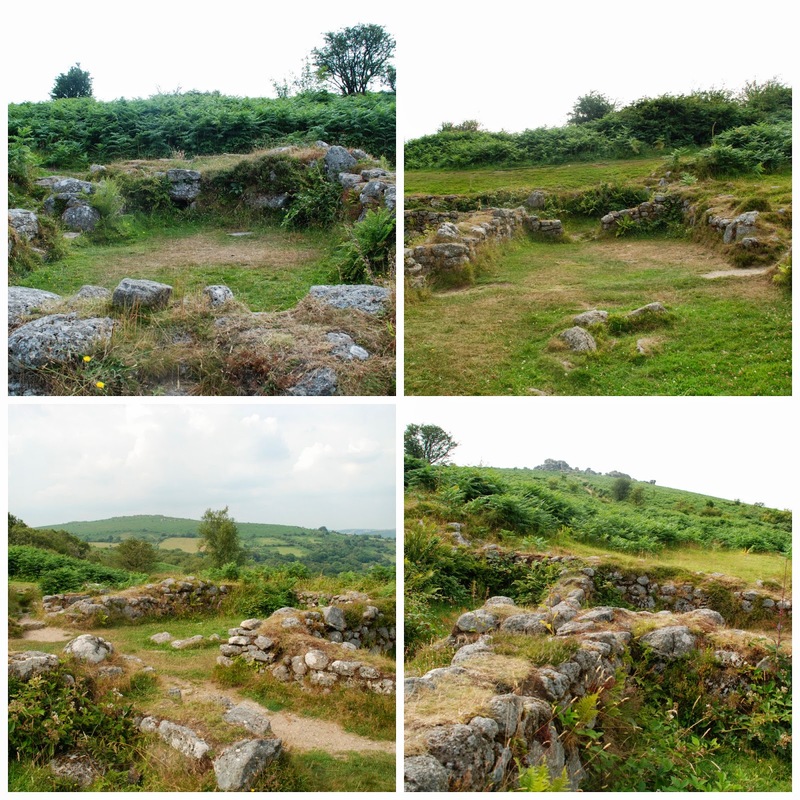 This is Haytor. They've cut steps into the rock face all the way to the top so, when you climb it, it's a bit like going up the stairs at home, although the view is a great deal more impressive. Even though the ascent is all a bit easy-peasy pedestrian you still get an irrational feeling of achievement when you reach the top and look out across the untamed wilderness of the moor. And then, on the way down, you can admire the lovely Dartmoor heather, which is looking very pink and rosy round about now. This bleak and wonderful place (photographed below), just around the corner from Haytor is Hound Tor, which according to the legend is all that remains of a bothersome pack of hounds who were cursed by a local witch and turned to stone. It's said to have been the inspiration for Arthur Conan Doyle's Hound of the Baskervilles. And if you follow down the avenue of stones, and over the brow of the hill into the valley on the other side you'll come across the abandoned village of Hundatora. It consists of four thirteenth century Dartmoor long houses with a number of barns and smaller shelters. History doesn't record exactly when it was abandoned or, perhaps more intriguingly, why everyone scampered. When it was excavated the archeologists found a single coin from the reign of Henry III (1216 to 1272). They believe that the people had gone by 1350. Perhaps they were wiped out by the Black Death when it reached England in 1348, or maybe they simply migrated to find a more profitable living elsewhere in the aftermath of the plague. It was a time of great social upheaval:labour was scarce, wages rose and those who survived were able to move around and command a decent day's pay. It's an eery place that I wouldn't care to linger in on my own late at night. We stopped by one day last week when the thunder from a summer storm was rumbling around the hills in the distance. Fearing the rain everyone else had (sensibly) vanished off the moor, and we were left totally alone with the wind and the bracken and the menace of the storm clouds overhead. If you return to the road and wander on in the direction of Moretonhampstead, to a cross roads where the main road intersects a moorland track, you'll find the grave of Kitty Jay. Kitty had been abandoned as a baby in the 1790s and brought up in the poor house at Newton Abbot. When she was taken in the authorities had given her the name Mary Jay, but somehow, for reasons that are lost to history, she became known as Kitty Jay. Kitty endured a hard and loveless life in the poor house, and when she was in her early teens she was sent out as an apprentice to a farmer and his wife at Canna Farm, near Manaton. Now in those days in that part of the world an apprentice was really a polite name for a skivvy, or a maid-of-all-work, who was in reality a badly paid dogsbody. By this time young Kitty had, however, grown into a pretty girl, and before long she caught the eye of the farmer's son. He seduced her and left her in the family way. And then, being a bounder, he refused to do the honourable thing. Poor Kitty was thrown out by the farmer and his wife who roundly blamed her, rather than their precious son, for her condition. The name Jay, which she'd been given as a baby in the poor house was, after all, a slang name in those parts for a prostitute. Kitty desperately didn't want to return in disgrace to the joyless existence of the poor house, but she realised that as a fallen woman no other respectable family would take her in and give her employment. Seeing no way out of her predicament she hung herself in one of the barns at Canna. Back in Kitty's day it was regarded as a serious sin to take your own life, and the folk thereabouts feared the restless soul of the suicide. It was forbidden by Church law to bury her body in consecrated ground, so it is understood that they buried her at the cross-roads in the dead of night, believing that her tormented soul would be disorientated should it return to haunt the living. Oftentimes they also drove a stake through the suicide's heart at the time of burial to hold them in their grave for good measure. It was said that the pixies attended to Kitty's grave, looking after her final resting place through all eternity by way of some small compensation for the miserable life she'd led. For many years fresh flowers appeared mysteriously every day on the grave. I have to say that every time I've visited there have only been plastic flowers, but before my time there appears to have been a mystery mourner who tended her grave. On moonlit nights travellers have reported seeing a cloaked figure kneeling over the grave with its face buried in its hands. Given its great hooded cloak no one could tell for certain whether it was male or female, but the rumour grew that it was the spirit of the feckless boy who'd betrayed Kitty's trust and been sent to stand vigil at her grave by way of penance for how he'd wronged her. Years ago someone opened the grave and found human remains, which were duly reinterred. Given the site of the burial it seems overwhelmingly likely that the deceased was indeed a suicide. Admittedly no one can say for sure whether the remains were really those of Kitty Jay, but if they were I hope that she's resting in peace and that she has some sense in the afterlife of how her story has touched so many people who come to pay their respects at her grave. Kitty's no longer an unloved nobody: these days she's a proper Dartmoor legend.